Japan's prime minister Abe Shinzo has shaken up the world economic circles with Abenomics, his bold mix of scatter shot fiscal boost, extremely loose (some would say slutty) monetary policy and a bundle of gift-wrapped regulatory changes benefiting supportive company presidents and reticent gestures in the direction of structural reform. Yesterday's government release on GDP in the first quarter of 2013 hints that Abenomics seems to be doing very quickly to the Japanese economy what the Friends of Abe have spent years trying to do to Japanese diplomacy: namely, run it into a ditch. The above is a parody. However it is no more absurd than many of the prematurely laudatory, rose-colored glasses-wearing articles appearing yesterday in response to the government release of GDP estimates for the Jan-Mar quarter. Later - Via Bloomberg: Goldman Sachs researchers have tried to find inflation expectations above and beyond those created by the mandated rise in the consumption tax from 5% to 8% next year. 4) economic behavior taking advantage of inventory clearance and special promotions in anticipation of companies trying to raise prices via the introduction of new products and services. 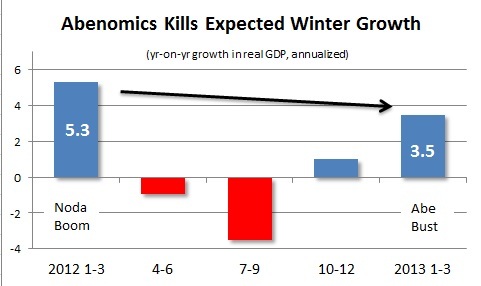 Under scenario 1, the economy keeps chugging through 2014 with a small, sharp dip after the tax rise. In scenario 2, economic growth is strong until the imposition of the tax, after which it falls off a cliff. 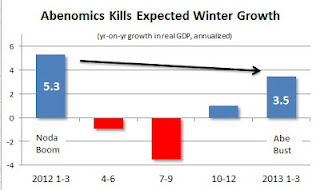 Under scenarios 3 and 4, economic growth declines through this year, then falls of the cliff with the tax rise. I know that the wealth effect of rising asset prices will provide a kick to certain sectors of the economy -- but the effects of wealth effect driven demand do not seem likely to have major impacts on domestic wages and employment.